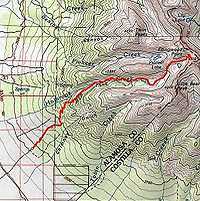 The Blanca Peak Trail is one of Colorado's toughest. 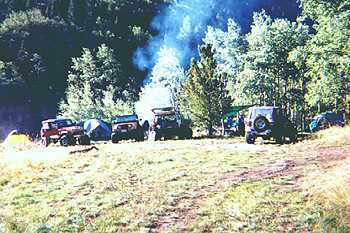 It is rated as a 9 on a 10 point scale by the Colorado Association of 4WD Clubs (CA4WDCs) . "This trip was a gas!!" 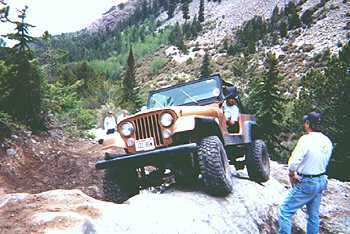 On Saturday, September 1st 2001, Hobos Marc "Nugget" Gilbertson (CJ7), Paul & son Bret Weisz (CJ7), the "Mad Max" (TJ) Maxwell family (myself and Janet, with sons Pete and Tom), and guest Jason Brew (XJ). We all headed out of Denver Saturday morning for the drive down to the sand dunes and a nice Labor Day Weekend. It was a nice scenic drive down through the town of Westcliffe and up over Medano Pass, dropping into the back side of sand dunes area. 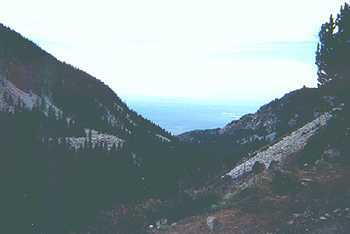 Medano Pass is a nice trail, and has numerous sandy creek crossings on down to the sand dunes. We pulled in before dark and got camp set up in a nice location. Couldn't get as close to the dunes as we wanted due to the number of people there over the long weekend, but had a great spot none the less. Lots of fun telling un'BEAR'able stories around the camp fire that night. Recent news about the little ravenous bruins, and Paul's artful imitation of a bear in the bushes (nearly cost him a beer bottle between the eyes) had us all on our toes the rest of the night. Sunday morning September 2nd, found us hooking up with fellow Hobo and trip leader Sean "Joker" Tallant who came over from Pueblo for the day's run up the 'Extreme 9-rated' Blanca Peak Trail. 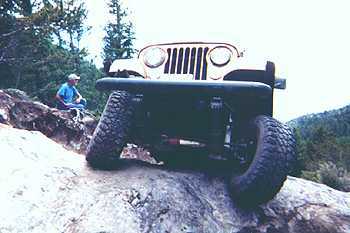 There were also a few other MHJC members at the trailhead to which we said hello and 'Jeep, Jeep' before taking off up the mountain. There were a few other rigs behind us, but they quickly fell behind as the mountain got steeper and the rocks bigger. Our first stop (challenge) was Jaws 1. We watched a small group go up in front of us, and then we took our turn. Made it over with little or no trouble, and just a little strapping for a couple of the rigs. The pucker factor of off camber rocks was just a warm up for Jaws 2, our next big challenge. There was quite a line waiting to get over Jaws 2. This one is a real 'SOB'. It would be a tough obstacle even without the off camber rocks with the couple hundred yard open plunge to the valley below. Glass and broken trees in the bottom were reminders of someone who'd gone over the edge the week before. Jason left his rig before the obstacle, as he's not fully locked and ready for this one. The rest of us made it over with lots of tries, rock stacking, a little winching here and there for high centers and plenty of white knuckles. Then it was on up to Jaws 3. This is another great obstacle. Sean, Paul and Scott made it up after several attempts and some hair-raising wheel stands and leans into the bedrock. All we had to show from it was a dented rocker panel and small broken part on front hub of Paul's vehicle after he slipped back into one of the rocks. He'll try a different line next time. Mark decided this one was a spectator event. Once through this Jaws 3, we headed down. Had a little wait for a broken Jeep in the trail, but not too bad. Going back down, Jaws 2 was even scarier than going up, but all made it through again with racing hearts and slightly dented steering wheels. This is an awesome trail with some really tough obstacles. Heed the warning and don't try this one unless your rig is well set up and you've got some buddies with you to lend a hand. We didn't go all the way to the top due to congestion and getting late in the day. Rumor had it there were a bunch of Greenies at the top taking pictures of Jeeps that came up to get license numbers, etc. for their continuing crusade to close the place. The bone heads set up a huge camp up on the open tundra and had Lama's that had packed in all their gear, champagne, streamers, etc. munching away and trampling the tundra. What's wrong with this picture!!!!! Some folks stay on the trail, and the Greenies that think they're doing good tear the place up. Go figure. All of the hikers we passed on the trail, and there were tons of them, were very nice and cordial and seemed to be enjoying this lovely place. Too bad there are some others that can't seem to enjoy varied forms of access. Trip home was a 'gas'. After Blanca we stopped at the gas station by the dunes. Guess what - all sold out of gas. What a drag. We limped back into camp with Paul and the thirsty V-8 needing a little drink from Mark's gas can. On the way back we decided we didn't have a handle for Mark yet. Since he's driving a gold Jeep and recently dumped the bucks in, we started with 'Gold Miner' and then shortened to 'Nugget'. So glad you have a new handle Mark. Thanks for leading the trip Sean, it was a great run and everybody had a blast.